Selected Papers. Introduction to Solid Sample Pretreatment. Conventional procedures for sample pretreatment and their standardization. The state of the art in sample preparation. Problems encountered in automating sample preparation. Batch versus serial approaches to automated sample preparation. Analytical Freeze-Drying. Steps of the freeze-drying process. Variables influencing the freeze-drying process. Freeze-drying methods. Computer-assisted analytical freeze-drying. Analytical Uses of Ultrasounds. General aspects of the cavitation phenomenon. Types of ultrasonic devices. Ultrasound-assisted leaching. Ultrasound-assisted sampling. Solid Sample Treatments Involving the Removal of Volatile Species. Hydride and cold mercury vapour generation. Headspace sampling. Analytical pervaporation. Solid-phase microextraction. Microwave-Assisted Solid Sample Treatment. Fundamentals of microwave energy and its interaction with matter. Microwave equipment. Variables governing microwave-assisted processes. Applications of microwaves to solid sample treatment. High-Pressure, High-Temperature Solvent Extraction. Variables affecting the extraction process. Accelerated solvent extraction. Dynamic pressurized solvent extraction. Analytical Supercritical Fluid Extraction. Properties of supercritical fluids. Laboratory-built and commercial supercritical fluid extractors. Variables influencing supercritical fluid extraction. Approaches to improving SFE performance. Devices For Solid Sample Treatment Prior to Introduction into Atomic Spectrometers: Electrothermal Devices and Glow-Discharge Sources.. Electrothermal atomizers and vaporizers. Glow-discharge sampling. Other solid sampling approaches. Laser-Assisted Solid Sampling. Laser ablation. Laser-induced plasma spectroscopy. Robotic Solid Sample Pretreatment. Workstations, robots, modules and peripherals. The role of robots in the analytical process. Analytical scope of application of robotics. Present and future of robotics. This book aims to provide scientists with information about a series of techniques that can be used with a view to facilitating the transformation of the sample to an appropriate state for subsequent detection or quantitation of its components of interest. The techniques dealt with range from the very simple ones (e.g. freeze-drying) to other more complex ones (e.g. glow discharge and laser-induced breakdown sampling). 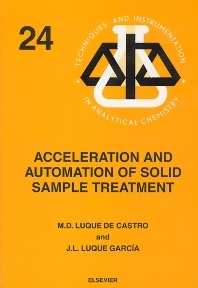 This is the first compilation ever on the subjects of acceleration of solid sample pretreatment; automation of solid sample pretreatment; and integration of solid sample pretreatment and detection. Readers will find here the information required to compare and select the best choice for each sample treatment need and ways to facilitate or automate the most complex and time-consuming step of the analytical process when solid samples are involved. For Departments of Chemistry, Biology, Veterinary, Health and Engineering. Also for use by environmental agencies and public and private laboratories of analysis.